David Brin's book "The Transparency Society"
Thompson opines that "the internet has inverted the social physics of information." He cites the 2007 actions of Redfin, the online real estate brokerage firm, which was moved through its blogs and press releases to disclose aspects of the clubbish brokerage business. 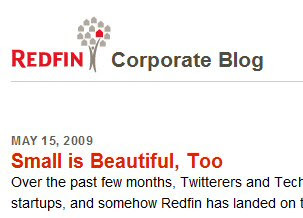 For example, Redfin's blog includes a spreadsheet with its current (April 2009) transaction summaries. Bill Moyers' Journal featured an interview with Daniel Coleman. Coleman discussed his book, Ecological Intelligence, in which he promotes life cycle assessment (a concept taken, I'd argue, from late 70's IT, when it was introduced for federal IT oversight). Initiatives thought to be "green" might turn out to be less so when the full life cycle of the product or process are considered. (Coleman recommends GoodGuide.com). Beyond Redfin and life cycle initiatives, what are the use cases for radical transparency? Check out http://www.OpenBrands.org. We're filtering Twitter for reach time Brand Conversations, and providing Brand Metrics. Also, follow @openbrands Twitter (http://www.twitter.com/openbrands/) for our research in radical transparency in Brand management.